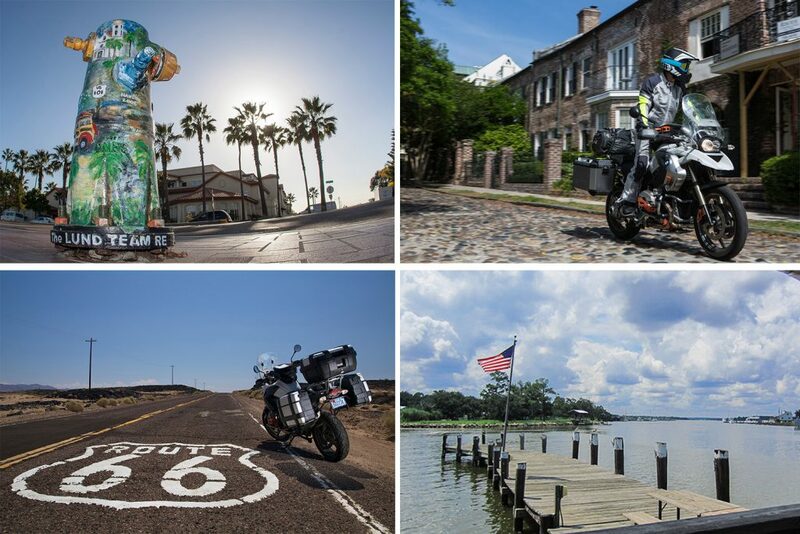 A trip across the US is every rider’s dream. Itineraries like the Historic Route 66 or the beautiful Highway 1 in California have become a sort of a myth thanks to all the references seen in movies and read in books. There are of course many more destinations to enjoy while riding in the US, like the Yellowstone Park area in Montana in the Summer, or the coast of Oregon and the interior of Washington State, the Pacific Northwest. Can’t miss States? Utah, Colorado, Arkansas and its Ozark Mountains, then again the Smokey Mountains across Georgia, Tennessee and North Carolina, or the back country of New York State or Pennsylvania. Last but not least, the Atlantic Coast from Charleston in South Carolina all the way down to Northern Florida passing through Savannah and Brunswick in Georgia. A quick research on the internet will yield a thousand ideas and inspiring routes. HOW CAN THE DRAM TURNED INTO REALITY, HOW TO GET READY FOR A FUN ADVENTURE ON THE AMERICAN ROADS? First of all you need to decide whether you want to bring over your own motorcycle or maybe rent one once you get there. We suggest renting, because the costs of shipping the motorcycle can be very high and once reaching destination there is always the problem to insure your ride. Can be costly and with a lot of limitation. So, unless you want to stay and travel for more than two or three weeks, it’s probably smarter to rent. Go with the top player in the business: Eagle Rider (www.eaglerider.com). Originally specialized in Harley Davidson cruisers, the rental company now offer several different touring and adventure touring solutions across the Country, from more than 100 different location. To get an idea, a Harley 1200 Sportster rented in Los Angeles will cost you around $125/day and a Honda VFR1200 Interceptor on the east Coast (Atlanta) can get all the way up to $185/day. Offers and availability change with cities and location, of course: they have office all over the place, like Miami, San Diego, New York, Chicago and Seattle. You will be able to use your European driver’s license but be mindful that some States require by law an International permit, so double check before confirming your rent. Be also mindful of the extra costs, like full coverage insurance and a normally hefty deposit (that will be of course returned at the end of your rental if nothing unfortunate happened). Be also careful with what helmet you are going to wear: a few Sates in the US do not have mandatory helmet laws yet, but most do. You can choose to bring along your ECE approved helmet but remember that in case of accident the local insurance could reject your claim based on the fact you were wearing an “unlawful” lid. We also recommend an extra injury insurance policy and you can normally buy that together with your airplane ticket: it’s very affordable and a must have. A Country as big as a continent that speaks the same language and uses the same currency: that makes for some easy arrangements and a smooth experience. Most of the information is easy available on your smart device, just be careful with those roaming costs for your data traffic. In alternative you can get a GSM chip from a local phone provider (like T-Mobile) or rely on the easy available free Wi-Fi hotspots. There are everywhere in hotel lobbies, McDonald’s restaurants and Starbucks coffee shops, for example. Hotels are everywhere and normally very affordable (decent ones with parking, breakfast and free Wi-Fi start at $60 per night). All the hotel chains have their smartphone app that you can use to get better rates and book in advance: we suggest to ride all day with our worries and only start looking for the hotel when you are close to your destination. Remember that in the US you pay by room and not by occupants so it can be even cheaper if you share the room with three of your travel buddies: yes, it would still be $60 for the night! Food: it really depends on your personal taste, but The United States are the land of 24/7 ready available food. There are chains for everybody. Do you like burgers? Then you have McDonalds, Burger King, Wendy’s, In&Out, Hardee’s and many more. Craving some chicken? Go to KFC or Popeye’s for fried chicken, Pollo Loco for grilled and Chick Filet for everything in between. Mexican? Taco Bell, Del Taco, Chipotle and a thousand more. Pizza? Domino’s, Pizza Hut, Papa John’s and a gazillion more. If you are not afraid to spend a few more dollars the options are way better in term of taste and ambiance. Diners like Denny’s, IHOP or Waffle House are everywhere. Steak? Black Angus, Lone Star or the Aussie Outback. Just remember that there is more than just fast food or chains in the Sates: keep your eyes open and you’ll find a million of different local restaurants that cook traditional, delicious food without all those industrial ingredients you normally find elsewhere.